Can’t decide whether to have nachos or stuffed shells? Have them both in this fun and tasty fusion recipe. Photo courtesy National Pasta Association. Almost everyone loves nachos, almost everyone loves stuffed shells. So this should be the perfect fusion dish! It certainly is fun and tasty. You can reduce the calories with lowfat versions of sour cream and cheddar. To spice it up, use Cabot’s Chipotle Cheddar or Hot Habañero Cheddar, or the 50% Reduced Fat Jalapeño Cheddar and Pepper Jack Cheddar (for more information see CabotCreamery.com). The conch shell, or conchiglie, is one of the more popular shapes of pasta. Jumbo shells can be stuffed with standard ricotta, luxurious crab or fusion flavors like taco or Thai fillings. Small shells are a great everyday pasta for sauce, soups, salads or macaroni and cheese. Read more about pasta shapes in our Pasta Glossary. November 6th is National Nachos Day. Here’s the history of nachos. SAUTÉ the beef in a large skillet until browned; drain well. Add the taco seasoning mix and water; simmer 5 minutes or until thickened. STIR in the beans and cheese. Cook until smooth and well mixed. DRAIN cooked shells well. 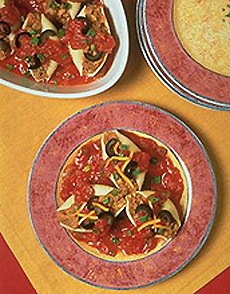 Fill the shells with beef mixture (1 to 2 tablespoons per shell). COMBINE the picante sauce and tomato sauce in a saucepan. Cook until heated, stirring occasionally. SPREAD ½ cup of the tomato sauce over the bottom of a 9" x 13" baking pan that has been coated with cooking spray. Place filled shells side by side on top of sauce; pour remaining sauce evenly over shells. Sprinkle with olives. Cover with aluminum foil; bake 35 to 40 minutes or until thoroughly heated. Sprinkle with green onions. COVER and let stand 5 minutes before serving. Serve immediately. Garnish as desired (let people help themselves to the garnishes). Values provided are for low-sodium, low-fat substitutions on all ingredients, and do not include optional garnishes. Recipe and photo courtesy of the National Pasta Association. Other material Lifestyle Direct, Inc. All rights reserved. Images are the copyright of their individual owners.